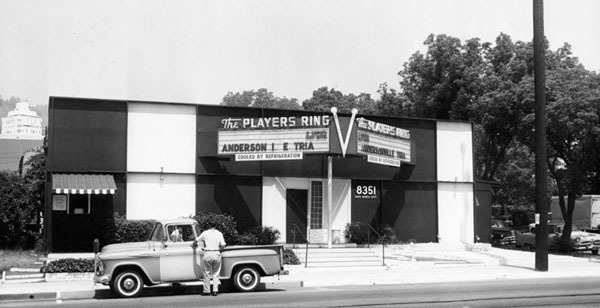 Players Ring, August 1961: Located at Santa Monica Blvd. and N. Flores Ave., the Players Ring was the best known and most popular theatre in the district. The Players Ring was an offshoot of the Circle, one of the first Los Angeles-based professional theatre groups. Formed in 1945 by a group of starry eyed UCLA students excited by the new concept of theatre in the round, the Circle opened a year later in a renovated store at El Centro and Waring, near Paramount Studios. During the Circle’s third season a schism developed, and in November 1949 Kathleen Freeman, along with troupe members Paul Levitt, Ted Thorpe and a half dozen others – “Variety” called them a “dissident group” – broke off and formed a new theatre that was also dedicated to performing in the round. 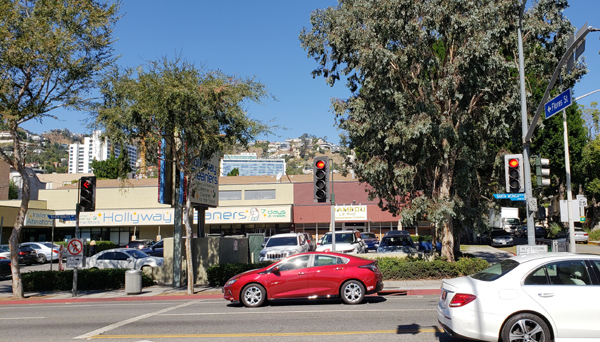 They acquired a former antique store at 8351 Santa Monica Boulevard at North Flores Avenue in what is now West Hollywood, and renovated it into a 200-seat theatre they called the Players Ring. Over time, as her screen career took off, Kathleen Freeman became less involved in the group’s day to day operations and production, and Paul Levitt and Ted Thorpe assumed the management of the company. In 1955 they acquired the 200-seat Gallery Stage a few blocks east on Santa Monica Boulevard at Crescent Heights, which they renamed Players Ring Gallery. In 1957 they assumed the lease on the Civic Theatre on La Cienega. “The three legitimate Players Ring theaters are the only group in the Los Angeles area offering legitimate theater 52 weeks a year,” the Times reported. Among the future television stars who appeared at the Players Ring were Ellen Corby (Grandma on “The Waltons”), Barbara Bain (“Mission: Impossible” and “Space 1999”), Jack Cassidy (frequent sitcom guest star and father of David and Shaun Cassidy), Bea Benederet (“Petticoat Junction” and “Beverly Hillbillies”), Harvey Korman (“The Carol Burnett Show”) and Bernie Kopell (Dr. Bricker on “The Love Boat”) among many others. But hands down the biggest star who got his start at the Players Ring was a kid who came to Hollywood from Neptune, N.J., in the mid-1950s and got a job in a studio mailroom, where he came to the attention of Joe Pasternak. The producer encouraged the kid to take up acting. He studied at the Players Ring, and it was there in 1956 that he landed his first acting job – in a supporting role in “Tea and Sympathy,” a coming-of-age drama set at a boys’ school. The young lead in the play was Michael Landon, who would go on to play “Little Joe” Cartwright on the Western series, “Bonanza” for 14 seasons. The kid in the supporting role was Jack Nicholson. In the early 1960s, Ted Thorpe left the Players Ring to produce independently, and the Ring group dropped its lease on the Civic Theatre. Then came the fire at the Players Ring in June 1964 that gutted its interior and collapsed the roof. The dressing rooms, costumes, sets and props and theatre seats were lost. All that remained was the front wall and the marquee. Pledging to rebuild, Levitt temporarily moved operations to the Gallery (today’s Coast Playhouse), where the next scheduled production, “Thousand Clowns,” starring Ted Knight (later Ted Baxter on the “Mary Tyler Moore Show”), opened on time. A year later, however, citing rising building costs, Levitt announced that the original Players Ring theatre would not be rebuilt, and that a shopping center would be built in its place. The organization was now down to one theatre, the Players Ring Gallery, which Levitt rechristened as simply the Players Ring. But its moment was passing – a downward trajectory that accelerated with the death of Paul Levitt in September 1968. His obituary in the Times described him as “a leader in this city’s theatrical renaissance,” noting that he had produced over 300 plays at the Ring group theatres. He’d also been an associate producer for CBS-TV and vice president in charge of daytime programming, according to the Times, and had produced a Tarzan series for NBC. He was 41 years old. Site of the Players Ring today. The Players Ring continued for a while as a venue-for-hire, but its days as a theatrical company were over. The parking lot for the shopping center at N. Flores occupies the site of the Players Ring today. Moss Hart’s “Light up the Sky” (1953). “Merrily We Roll Along,” by George Kaufman and Moss Hart. Tennessee Williams’ “The Rose Tattoo” (December 1954) , starring Jody McCrea, son of Joel McCrea, and Francis Dee – Tennessee Williams was in the front row on opening night. Three by William Inge, “Picnic” (July 1955), by William Inge, directed by Kathleen Freeman; “Dark at the Top of the Stairs” (March 1960); and “A Loss of Roses” (August 1960). “End as a Man” (1956) with Robert Vaughn, the future star of “The Man from Uncle”. Two by Lillian Hellman, “The Children’s Hour (1956) and “Toys in the Attic” (1962). “The Matchmaker” (February 1958), by Thorton Wilder, the basis for the musical “Hello Dolly,” featuring Bert Convey. ”A Raisin in the Sun” (1961).